Personal Predictive Caltec Score® Report. Corporate Predictive Caltec Score® Report. 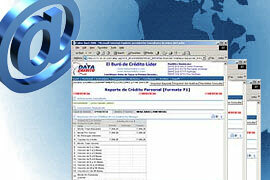 Report for Purposes of Collections or Localization. Check Endorsement Screening Report [ DECK ]. Risk Management System® [ SAR® ]. Electronic Anti-Fraud System [ SAFE ]. System for Screening of Information Applications by Batches. Service of Standardization and Unification of client portfolios.